HUG are an independent family business, stemming from central Switzerland. They have been baking specialties with select ingredients since 1877. HUG have formulated their own Magna Charta of Ingredients and they maintain a strong commitment to quality. Their company culture reflects innovation, tradition, sincerity, entrepreneurship, and thoroughness. 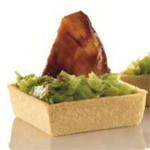 "Canape-sized, savoury pastry shell, ideal for filling with quiche, savoury mousse, etc., Semi-baked, savoury pastry shell. Sprayed moisture barrier"
Typical Swiss Chritmas Cookie. Delicate Almond and Cinnamon taste with eggwhite icing as well as the star shape makes the product specific characteristic of the seasonal specialty. Vienna wafer: short pastry with apricot filling. Bricoti: Heart-shaped biscuit with caramel cream & swiss milk chocolate. Truffet: Meringue biscuit with cocoa truffle creme coated in milk chocolate. Chocobelle: Chocolate biscuit with cocoa cream filling and milk chocolate. Baladin: wafers with almonds & cocoa cream, enrobed in choc. Chocofin: short pastry with choc cream filling & chocolate. "Semi-baked, savoury mixed-cereal pastry shell, ideal for filling hot or cold with quiche, savoury mousse, etc., Large savoury mixed-cereal pastry shell"
"5cm tartlettes are suited for cold as well as warm use. Can be filled with a spicy hot mousse for an aperitif or as an appertiser., Round semi baked savoury pastry shell"
"Semi-baked canape sized tartlettes flavoured with tomato and basil, giving a taste of Mediterranean cuisine., CanapÚ sized tartelettes with tomato & basil"